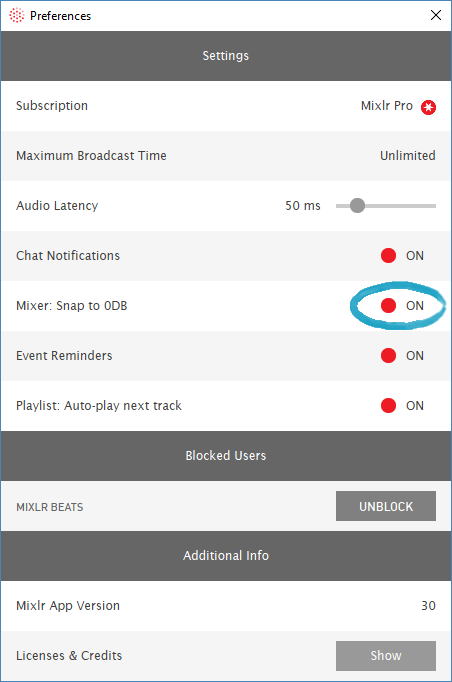 The Preferences window will allow you to update a number of options in the Mixlr desktop app including in-app notifications, reminders, and settings for the faders and playlist. To open the Preferences window, click the Window tab in the Mixlr desktop app and select 'Preferences'. 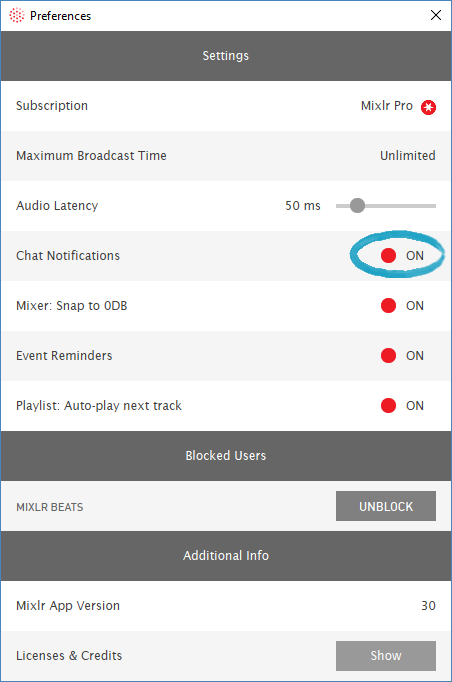 Toggling this button on allows you to receive notifications of new chat messages on your live page, while turning it off ensures that you won't be disturbed with notifications while you're broadcasting. By default the fader bars in the desktop app that control the volume will 'snap' - or jump - to 0 dB (decibels) when you drag them near that setting. (0 dB means that the audio signal in this channel hasn't been increased or reduced in volume from the original source.) You can deactivate this by toggling this button off. Click here to find out more about adjusting the volume. With this button switched on you will receive reminders when an event you have scheduled is coming up. Click here to find out more about scheduling Events. 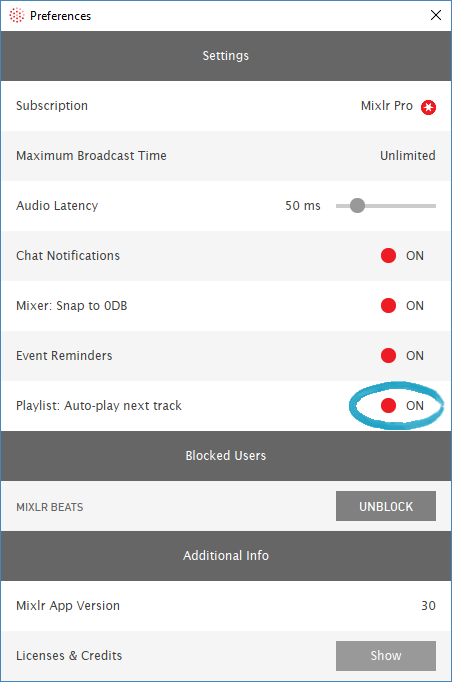 With this button switched on your playlist will automatically play the next track when the current track has finished (as long as there is another track in the playlist). You can deactivate this feature by toggling this button to off. Click here to find out more about your Mixlr playlist. A list of all the users you have blocked from chatting on your livepage is listed here. You can unblock any blocked users by clicking 'UNBLOCK' for that user. Currently it's not possible to re-block a user that has been unblocked from the Preferences menu. 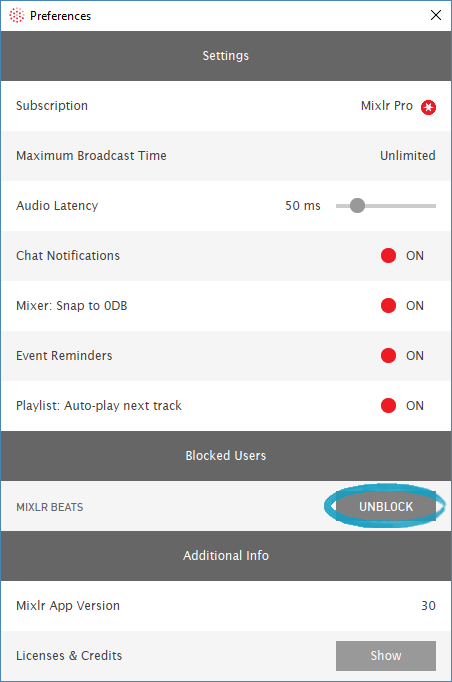 Click here to find out more about blocking users. TIP: Once you have made your updates you can close the Preferences window - the new settings will save automatically. 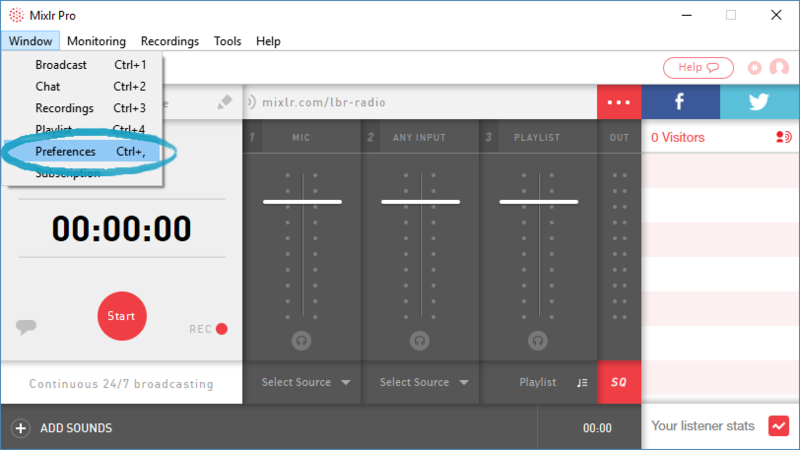 The preferences window displays the version of the Mixlr desktop app that you're currently using. This is displayed at the bottom under the 'Additional Info' heading. 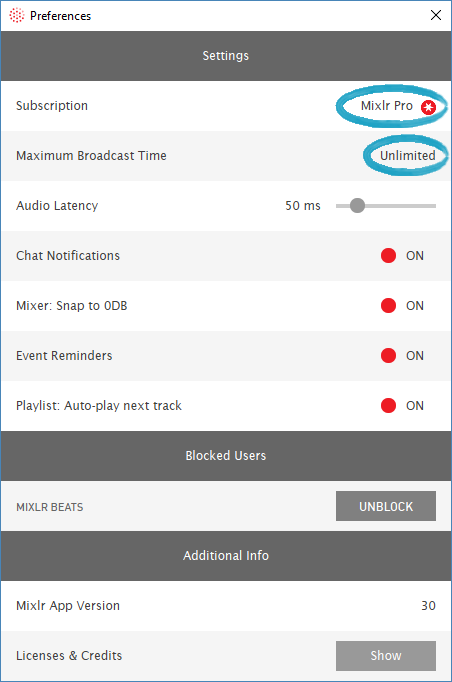 At the top of the Preferences you'll also be able to see the Mixlr plan that you're currently subscribed to, and what the Maximum Broadcast Time for your plan is.